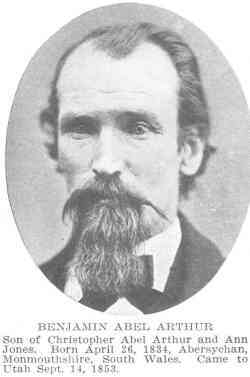 BENJAMIN ABEL ARTHUR, a MORMON SHOOTER AND CLUBBER and Sgt. Company D, in the Iron County Militia; Born: 26, April, 1834, Abersychan, Monmouthshire, South Wales, England, Son of Christopher Abel Arthur and Ann Jones. Arthur was present at Mountain Meadows for the final massacre.